MIAMI - The frequency of serious, unprovoked alligator bites has grown in Florida along with the state's population - but fatal attacks remain rare. Still, after a boy was dragged into the water at a Disney World resort near Orlando, as well as two separate incidents where gators were discovered gnawing on dead bodies, questions have arisen about these modern day dinosaurs. Both crocodiles and alligators evolved from a common ancestor with dinosaurs. Alligators are believed to have remained relatively unchanged for nearly 37 million years. Alligators can be found in fresh and brackish bodies of water - including lakes, rivers, canals and golf course ponds - and there's an estimated 6.7 million acres of suitable habitat statewide. Alligator bites are most likely to occur in or around water, as gators aren't well-equipped to capture prey on dry land. While that's comforting for people in, say, Arizona, the state of Florida has over 1,000 miles of coastline and countless marshes and rivers, especially in the southern portion of the state around the Everglades. As development pushes people deeper into the Florida wilderness, more water-based contact with the creatures appears inevitable. Jack Hanna, director emeritus of Columbus Zoo and Aquarium, told CBS News that alligators can be found almost everywhere in Florida. "It's amazing how far they can travel to get to another place to find food," Hanna said. Alligators are opportunistic feeders that will eat what is readily available and easily overpowered. It's illegal to feed wild alligators because that causes them to lose their fear of humans. While gators can lunge at prey along a shoreline, there's no evidence of alligators running after people or other animals on land. Nick Wiley, executive director of the Florida Fish & Wildlife Conservation Commission (FWC), told CBS News that if a gator "attacks a human it's mistaken." "Alligators are not very sophisticated when searching for food," Wiley said. The FWC says their diets normally include "prey species that are abundant and easily accessible. Juvenile alligators eat primarily insects, amphibians, small fish, and other invertebrates. Adult alligators eat rough fish, snakes, turtles, small mammals, and birds." Hides, meat and other parts can be sold from legally harvested alligators. In 2014, the hides and meat from harvested gators was worth $6.8 million. Since 1988, the state has held an annual alligator harvest, which the FWC says "has been nationally and internationally recognized as a model program for the sustainable use of a natural resource." In 2014, more than 7,000 alligators were "harvested" as part of the program. There have been 23 fatalities caused by wild alligators in Florida since 1973, among 383 unprovoked bites not caused by someone handling or intentionally harassing an alligator. 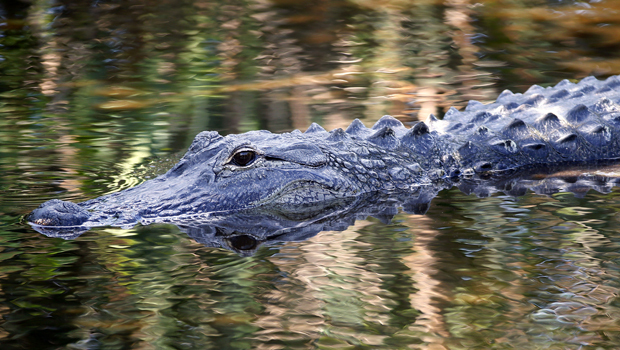 Florida averages about seven serious unprovoked bites a year, and officials put the odds of someone being seriously injured by an unprovoked alligator in Florida at roughly one in 2.4 million. Most of the eight children and 15 adults had been in freshwater bodies of water. Other victims include: a 2-year-old girl who wandered 700 feet from her fenced backyard; a 3-year-old boy who left a roped-off swimming area in a county park to pick lily pads; a 36-year-old man swimming across a pond while trying to elude police; a 54-year-old woman seized by an alligator while landscaping near a pond; and an 82-year-old man killed while walking his dog on a path between two wetland areas. If an alligator bites you, make a commotion: hit or kick the alligator, or poke it in its eyes, because alligators will retreat from prey they can't easily overwhelm. Jack Hanna advises, however, that the best way to avoid alligator attacks is simply to give it enough room. For about 20 feet, Hanna says an alligator could "outrun any human." Therefore, he advises giving yourself at least 40 to 50 feet of distance from any potential alligator hazard, or the creature itself.